Make encrypted phone calls on BlackBerry and Android phones | BlackBerry Blast! A new device offers BlackBerry and Android users the ability to make secure encrypted calls from their mobile device. 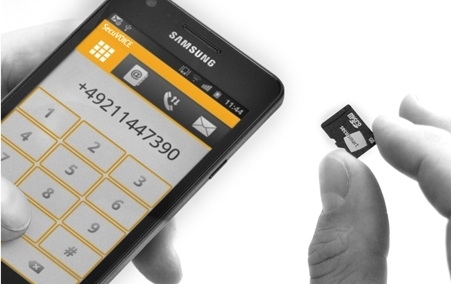 At the CeBIT show in Germany, Secusmart debuted a microSD card with a built-in processor, that allows users to make secure encrypted calls on their smartphone. The card goes in the microSD card slot of your BlackBerry or Android device (sorry iPhone users), and turns your normal device into a very secure communications device. The technology works over VoIP so you'll need to have WiFi or strong 3G to use it. Also, both parties will need to be using the card to take advantage of its 180-bit AES encryption.